Hello my dears! TGIF and hopefully this day will go smoothly for me. I'm swamped at work and I have to be in the field as well for a few hours. Every time I feel like I get something done, ten more things get thrown at me. Oy vey. What I would give to not have any responsibilities and play all day with my polish! One could dream, right? I have the 2nd part of the A Very Kitschy Christmas collaboration, and this half is made by Superchic Lacquers called Ugly Sweater Party. This is a sheer grey jelly loaded with silver microglitter, tiny ice blue glitters, and green hex glitters, making it the complete opposite color spectrum of its Hare counterpart called Gee, Thanks Grandma. The formula of this was really sheer but surprisingly not thick, making application a breeze. I left it at three coats but as you can see, it's still slightly sheer. I could have maybe gone another coat or layered it over matching grey base to minimize the sheerness. I wasn't careful enough with the glitter coming off the free edge, so my apologies in advance for not removing those pesky glitters. To finish, I used a layer of Gelous followed by my Poshe/GCS topcoat mix. I'm not sure if this is intentionally meant to be sheer to allow the glitters to shine through, but I do appreciate the play of colors together. It makes for a great wintery polish. Oddly, it also reminds me of a grey version of Deborah Lippmann's Mermaid's Dream. I like that the cool tones are completely opposite from the warm brown and red colors of the Hare polish and rounds the set out nicely. I got my first MoYou plate from a MUA swap and I thought the sheer grey jelly would be a great foundation to stamp over. My plate is the Artist Collection II, and I used the flower print located on the girl's shirt. I used my go to black creme for stamping by Wet N Wild. The plate stamped really well and the images transferred over very crisply. I love the way the pattern over the glitter jelly creates a faux mosaic glass window effect. I can totally now understand the craze over these MoYou plates. Not only are they cool to look at, the designs are fresh and modern and they perform extremely well. If only they weren't so pricey and have to ship from the UK! Maybe that's a good thing because my wallet can't handle any more damage. LOL... I love grey polish too - you remind me that I need to wear it more often!! This is gorgeous! I kind of actually like the sheerness of it. It gives it a subtle and soft look. 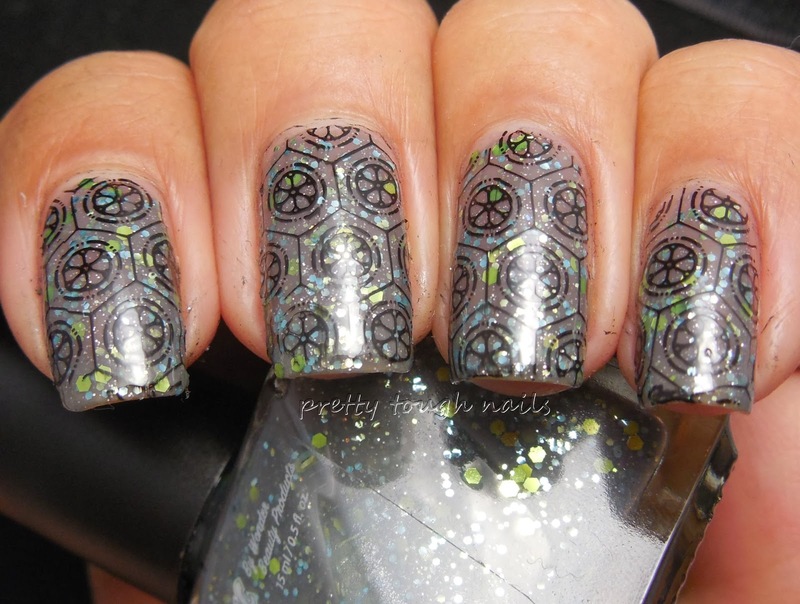 I also really love the stamping as well. My first thought when seeing it was that it looked like stained glass. It's a very pretty effect. You're right, I think it's suppose to be sheer to give it that softer look. Thanks for the stamping compliment! I always miss my tips but I'm going to keep practicing!